So there’s a few growing pains going on around these parts. If my blog were a car it would be my old 1994 Nissan Altima. Still works, kinda. Should probably be overhauled and upgraded to a much newer model…but it’s just not that broken yet. Maybe an unlicensed 15 year old will run a red light and total my blog just like one totaled my Altima six years ago. The biggest change is that I’ve added in links to my posts from over at babble. I sure do like writing over there. Keeps me busy. Keeps my brain occupied…which is doing wonders for my outlook on life. Just a couple of days I ago I started writing for another (I KNOW) babble blog…this one is about raising kids 4-8 years old. If you’re into math like Addie is (“SWEET! THERE’S ANOTHER MATH PROBLEM!” was overheard during homework this evening.) That’s just over 40 posts monthly between the two. Plus what I do here. And anywhere else I do stuff. I take a lot of pictures of my baby. And then when she goes to sleep? I stare at all the pictures of my baby. Oh my how I love these babies of mine. I have my first of four appointments to have my pregnancy face lasered off with frickin’ laser beams (hopefully not attached to sharks) today. It should be interesting. And hopefully not too painful. And yield glorious and amazing results. No pressure though. I’m all about reality. Oh my lord, the baby pudge. It is to die for. Also, your shark laser comment might have mad me snort laugh. I am so envious of your mad photography skillz!! So darn cute!!!! You are a writing machine! I love reading your stuff and I look forward to hearing about how the sharkless lasering went today. Your baby is so delicious she looks like she should be on top of a big ol’ chocolate fudge sundae. mmmmmm Scrumdidlyumptious. 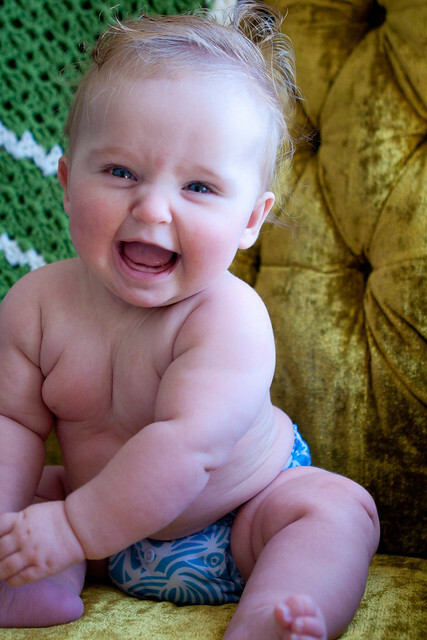 Oh my gosh, that gorgeous baby chub! I love your for your Austin Powers reference. And your chubby baby pictures, obviously. Is it wrong to say I want to much on that baby ? I’m not sure I care…the little baby chubs get me every time. Oh my goodness, her boobies! She is sooo adorable. Hope your laser beams went well! You certainly are one busy writing lady! You can get petechiae lasered off??? That’s amazing. I should look into that…..after the vericose vein treatments, that is.